Welcome once again to my continuing MTG Limited series Playing to your Weaknesses where I talk about what common and uncommon cards I think will make it into your decks at your next pre-release or other limited tournament. 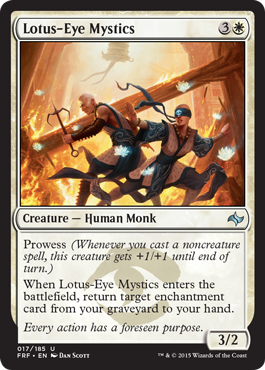 Today I’ll be starting my articles on the new Fate Reforged set. The set is smaller than it’s Khans of Tarkir counterpart, coming in at a paltry 185. There are no shortages of powerful rares and mythic rares, but how will the other rarities hold up? That’s what I’m here to look into today. The FRF (Fate Reforged) pre-release seems to be a little different than what we are used to. After looking online and asking a few of my local game shops, it seems as though the pre-release will be composed of 4 Fate Reforged packs, 1 Khans of Tarkir pack, and 1 seeded pack. Having 4 packs of FRF means there will be a lot more importance on using the new cards. Before you would supplement larger decks with smaller ones such as only opening 2 packs of Journey into Nyx at the end of the Theros block. The sealed/draft format totally changes when you move away from having a majority of your cards come from the larger set. For starters, Mana fixing will be a little bit worse without the tri-lands and there will be a lot less powerful multicolor cards (including morphs) that you can splash. Lots of people have been complaining about the seeded packs from previous releases and I can’t blame them. You always run into the problem of getting totally different cards in your seeded packs than what you get in your regular packs and it makes for a horrible gaming experience. Perhaps they’ll be better this time? We’ll see. 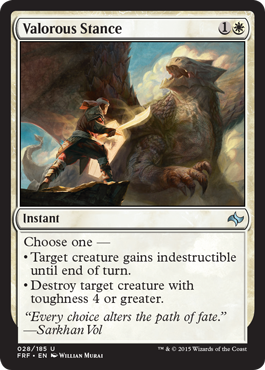 So just how different will the limited experience be with more than 70% Fate Reforged cards? Well, lets take a look at what white will be bringing us. I’m pretty sure that all of the dragons will see play, especially those in colors that normally don’t get powerful flying creatures. 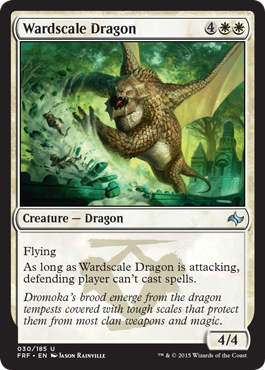 Wardscale isn’t the best, but certainly not horrible in a limited format that was previously lacking any good creatures with evasion. I like this card in Abzan decks that previously were playing lots of big creatures on the ground but had no presence in the air. He can stop instants from being played during combat, which will stop cards like Sandblast or anything else that says “kill attacking creature”, but it can also stop anything with flash getting put into play. This should save you from running into combat tricks and losing your creatures. The dragon forces your opponent to play spells before your attack phase, which could save you from late game tempo swings. Solid in sealed, alright in limited. It’s a somewhat weaker Smite the Monstrous, but it’s still a decent removal card. It kills dragons and other big blockers they might have, should hit most of those morphed creatures after they flip, and it also lets you use it as a combat trick. So they attack with a 5/3 and you have a 3/2? Block and make your creature indestructible to kill it. It still acts as a removal spell in that respect, albeit in a roundabout way. It can also save one of your creatures from an End Hostilities or Duneblast. This is what I would call a roleplayer card. It fits your curve well (especially if you’re light on morph creatures) but it also gives you a 3/2 for 3 that receives bonuses from the KTK Abzan captains such as first strike or flying (if you open them of course). It’s second ability isn’t bad either. The second ability might fit better in a Mardu deck where you’re looking to put as many bodies on the battlefield as possible, and the flying spirit token is definitely an upgrade over a 1/1 warrior. I’d play it in my Abzan or Mardu deck, and even consider putting it in a Jeskai deck too. Pressure Point is made for a quick Jeskai or Mardu build, but has applications in other strategies as well. When you want to attack early and fast, Pressure Point will tap their big blocker and open a path through and at the same time replace itself with a new card in your hand. It works well on both offense and defense. Not a high draft card, but something I would consider as one of my final choices in my deck. 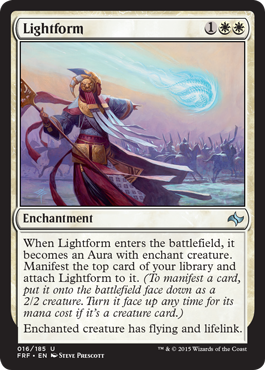 It’s almost on the same level as Force Away (return creature to hand, ferocious – draw and discard), the main difference being that Force Away is much better against Abzan decks playing with counters and also stops fight effects. A 2/1 for one mana is never a bad choice on turn one if you have it. 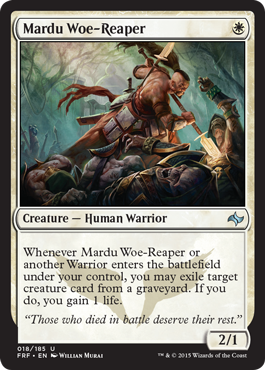 His incidental life gain should come in handy from time to time and you should have no problem finding warriors in Mardu colors. There are some reanimator/graveyard manipulation effects in this set, the most powerful being Tasigur, the Golden Fang, but this card’s more obvious use is weakening Delve heavy decks such as Sultai so they can’t play their powerful spells quickly. With 14-17 cards of limited decks usually being creatures, I think you’ll get good value out of the Woe-Reaper. He should also help out BW Warrior decks in standard against Sidisi Whip and Abzan reanimator I think. This is the biggest Prowess creature I’ve seen to date. It might be a little bit harder to build a Jeskai Tempo deck in sealed/draft when using a majority of FRF cards, but the Mystics’ power level is still nothing to scoff at. The 3 power will let him trade with something most of the time, and his second ability can be useful too. There are some decent enchantments in this set at rare, and even cards like Lightform and Cloudform might see some play in limited. If you were to get a card like Debilitating Injury in your Khans pack, you just might get a chance to play it twice. I like him in Jeskai builds a lot, but think he’d be a good fit in any white deck. He works well with the Ascendancies too. Sacrifice Mardu Ascendancy to save your creatures from an attack, then bring it back with him the following turn. I would DEFINITELY pay 3 mana for a 2/2 flying, lifelink creature. Sometimes you might just have a 2/2 land it enchants, but other times you could really luck out and enchant a 4 or 5 power creature and flip it for massive damage. I think I’d pick this card pretty highly in draft and it would definitely be in my sealed deck. 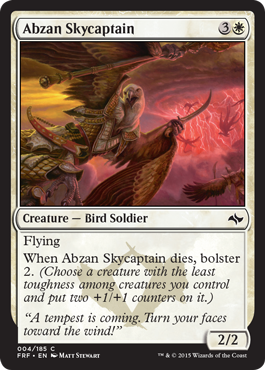 Sure you might deal with more flyers this time around in sealed/draft, but life gain on creatures such as Abzan Guide showed itself to be quite an asset in KTK limited. I think this card will see some play. Now we’re starting to get into some juicy cards. 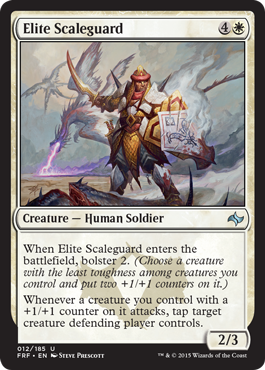 Elite Scaleguard is like the grandfather of all those other white Abzan Captains. 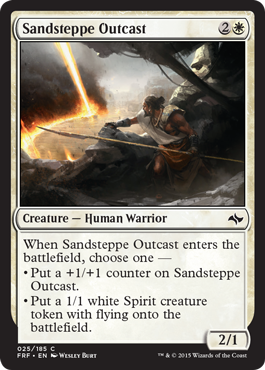 In fact, he is pretty much the ONLY white creature that has any semblance to those Khans of Tarkir Abzan cards that give bonuses to other creatures with counters on them. His ability is pretty damn good though. He turns any card with counters on it into a Master of Diversion (M14), and brings new depth to the Bolster mechanic. If the limited format is going to be focused more on Fate Reforged, you’ll definitely want to get all the Bolster and Abzan captains from KTK that you can. I would consider drafting him very highly and he would have an undeniable spot in my sealed deck too. You might think 5 mana is a bit high, but he plays well on an empty board (making a 4/5), and later in the game you can put those counters in a dangerous creature and push through your opponent’s defenses. Dragon Bell Monk – Dragon Bell Monk works well in the early to mid game, letting you get a few points of damage in before and surviving an attack if you have a spell to activate its Prowess with. Wandering Champion – 3 power for 2 mana is pretty good, and its looter effect isn’t usually something white gets. It would fit well in your curve, but not absolutely necessary in your deck. Soul Summons – if you’re really struggling for creatures in your deck, Soul Summons gives you a 2/2 bear to lower your curve with. If you’re playing a fast Jeskai tempo/Prowess deck, this gives you both a creature and the trigger for Prowess as well at an early point in the game. Not horrible. Sandblast – I’d much rather be playing kill shot, but if you need removal and don’t have any other choices it’s okay. White’s rares and mythics look pretty good, but I’m not exactly excited about what the uncommons and rares have to offer. I’m still not sure how the strange Pre-release format will affect deck building. Things might be okay if the seeded pack is all Khans of Tarkir cards, but if it’s a mix of both KTK and FRF, there might be some difficultly. One of the problems many players ran into was that they’d open up their seeded pack and find that the cards didn’t match up with the colors from their booster packs. In KTK limited, many people found it easy to build a 3 color deck thanks to the mana fixing, and quite a few people pushed their limited decks into 4 or even 5 colors. Most of the cards in FRF can be splashed thanks to single mana symbols, but I wouldn’t be surprised if FRF made playing 4 and 5 color decks harder. I think there will be fewer reasons to go into a 4th or 5th color, and that we might see some people actually playing a 2 color deck. These decks might lack power, but they will make up for that in consistency and synergy I think. I’ll be working on Blue next, so be sure to check back soon for the next installment! I’d like to hear what you think about the new KTK/FRF limited format, as well as what cards you think will work well in white. Please leave any ideas/comments down below. I gotta disagree about less decks running four or five colors. There will be a land that taps for two colors in every Fate Reforged booster instead of the basic land slot, or a fetch. That’s about as much fixing as most Khans boosters. I suspect that four or five color decks will be quite popular with veteran players at the prerelease. Really, it depends on what pushes them that way. Sure some people with a lot of experience with limited could pull it off.